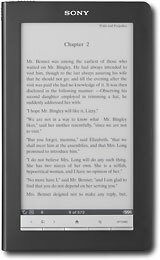 Looking around the internet, there are a few different ebook readers currently on sale. First, the Sony PRS-900 is selling for $249 from Amazon, Best Buy, and a few other electronics stores. That’s $50 less than it usually sells for and $150 less than its original price back in December. The Cybook Opus is down to $168 at B&H Photo. Most other stores are selling it for $199. In the UK, Pixmania seems to have recently lowered the price for the Cybook Opus to £165. Last week it was listed at 7 pounds higher. B&H Photo also appears to have the lowest price on the Sony PRS-300 at $138.99, about $10 less than other websites. The PRS-600 can found for as low as $152 at Amazon. In the UK, the Sony ereaders are finally starting to drop in price slightly. The PRS-600 is selling for £187 from Amazon UK and regualry sells for £194 from Play.com. The PRS-300 is £127 on Amazon UK . From Sony Style Canada, the Sony PRS-300 is marked down to $179 from $199 and the PRS-600 is down $20 as well to $229. Lastly, if you are looking to get an Aluratek Libre, Borders now sells it for $119 at regular price, which is typically $10 – $50 less than anywhere else.